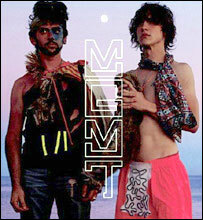 Brooklyn-based pop duo MGMT are making waves with the cosmic psychedelia of their debut album Oracular Spectacular. They were named "ones to watch" on several critical lists, including the BBC's Sound of 2008 poll, but the band nearly ended before they began. "We got signed at a point where we hadn't really talked to each other for the last six months," confesses lead singer and guitarist Andrew VanWyngarden. "We had never thought of MGMT as a real band. We didn't even have a live act." 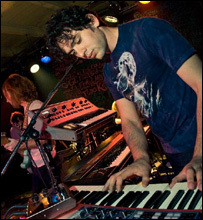 The group began at Connecticut's Wesleyan University, where VanWyngarden met keyboard player and co-vocalist Ben Goldwasser in 2002. The pair constructed an eccentric live show that was part art project, part musical experiment. Concerts consisted of karaoke-style performances, where they would sing over a pre-recorded backing track played from a laptop. "That was the first year of the band," explains VanWyngarden. "We didn't have any real songs, so we would just make something up and play it for everybody." Eventually, MGMT began to delve deeper into their laptop, creating songs that were "a little more structured". "They actually had lyrics and that kind of thing," VanWyngarden laughs. There is a certain degree of understatement and myth behind the band's origins. As obnoxious as they claim to have been, they built up a cult following - recording an EP in 2005 and touring with off-kilter pop combo Of Montreal. One fan - "a friend of a friend", according to VanWyngarden - passed the EP to a talent scout at Columbia Records, who contacted the band by e-mail to offer them a recording contract. Within months, the band were holed up in a studio with Flaming Lips producer Dave Fridmann concocting their heady mix of squiggly synths, euphoric melodies and shimmering, ghostly harmonies. "The songwriting sessions for this album were the first time we ever took it seriously," admits Goldwasser. "When we used to write songs in college, we'd think 'how can we make this sound like a real song,'" adds VanWyngarden. Reviewers have responded positively to their experiments. Rolling Stone magazine called Oracular Spectacular an "intergalactic odyssey", while the NME gushed "you'll be hard-pressed to find a record with more musical depth and warmth this year". The track that has attracted the most attention so far is the lead single, Time To Pretend. Originally the title track of their debut EP, it has been given a fresh coat of paint and transformed into an off-the-wall pop epic. Its lyrics reveal a vision of rock star excess: "Let's make some music, make some money, find some models for wives... We'll choke on our vomit and that will be the end." Do the band plan to turn this into reality now that they're on the cusp of musical success? "Hopefully not all of them," laughs VanWyngarden. "Probably the most rock and roll thing I could do right now is start drinking, forget all my lyrics and smash my guitar on the drums." "We haven't considered putting on Kiss make-up yet," adds Goldwasser. "But we'd like to make our shows more theatrical." "Yes," his bandmate agrees. "Right now they're pretty boring. We're not very exciting in real life." Some reviewers have been less than kind about their embryonic live act. 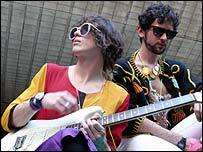 Music website Popjustice described MGMT's concert as the "impressive sight of several men taking a very listenable album and, via the magic of live musicianship, making it seem terrible". Perhaps it's a good thing that the band don't read their own press. "If they say something bad you just take it to heart," admits VanWyngarden. But their fans are more forgiving than the critics, packing out a series of UK shows before MGMT's album was even released. "It was surprising to see how many people had actually heard about us," says Goldwasser. "It's especially weird because we were locked up in the studio for a while, just kind of messing around in Brooklyn and playing music in a little bubble. "Then we came over here and everyone's talking about us. It's kind of crazy." Oracular Spectacular is out now.